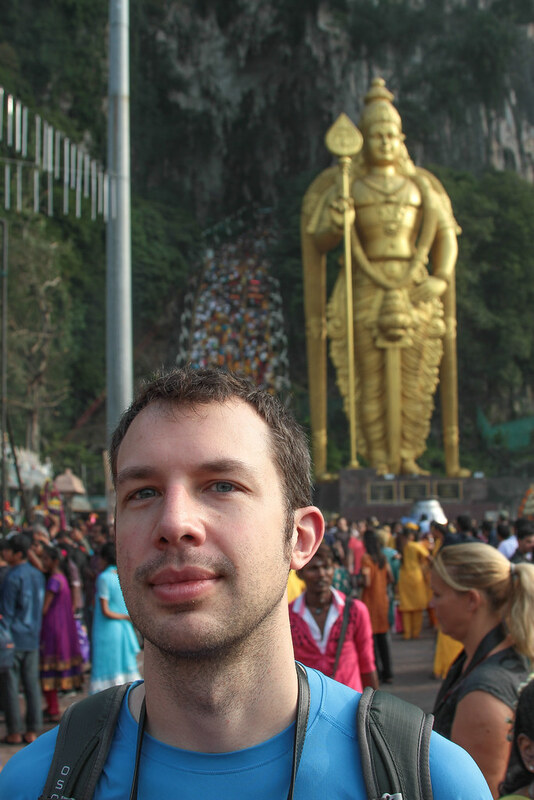 We didn’t realize we’d be in the area for the Hindu festival Thaipusam, but one of our taxi drivers had mentioned it the day before. He said we should get there early to see everything going on, and thus was the first day of our rather early rises both for it and the airport. 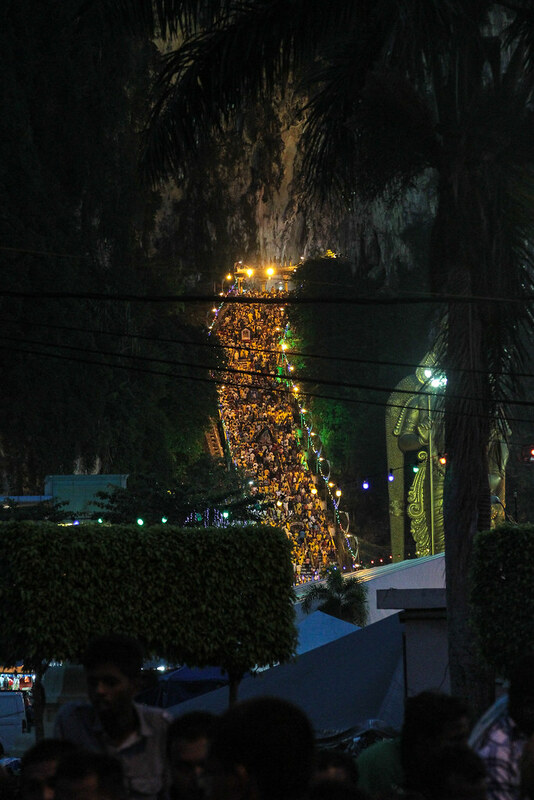 This event is held at the Batu Caves. We got there at 7am. From my photos it seems we started leaving around 9:30am. I’m going to speculate doing exactly what we did by that time would have take 3.5 to 4+ hours since the procession seemed to be moving quite a bit slower. Devotees prepare for many days before the event, and carry burdens to the stairs and up to the temple inside as offerings. What is held in many pictures are pots of milk. More elaborate structures and burdens are also pulled or carried, most attached with hooks to their bodies in some fashion. 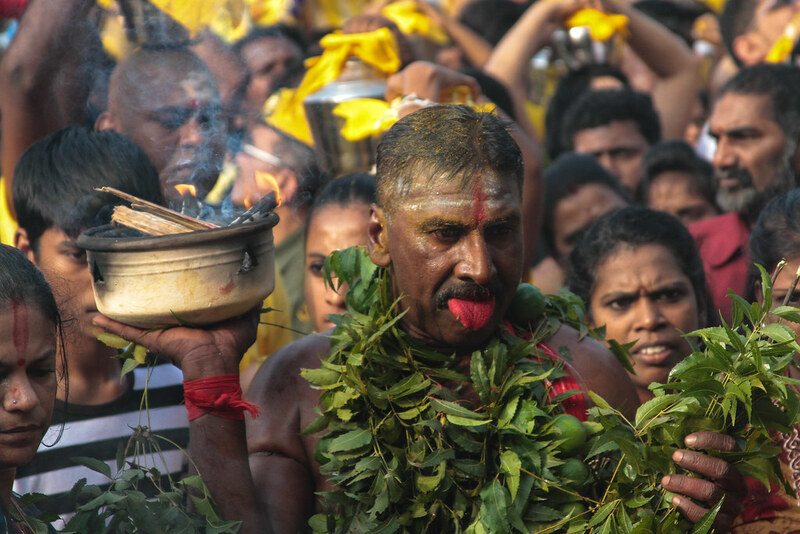 Many of the men (and some women) also have skewers through tongues, cheeks representative of Lord Murugan’s spear. Although there were a few more people when we were there; this is a 7am snap. Estimated attendance was to be 1 million plus. We read up beforehand and wore long pants, certainly all tourists did not. 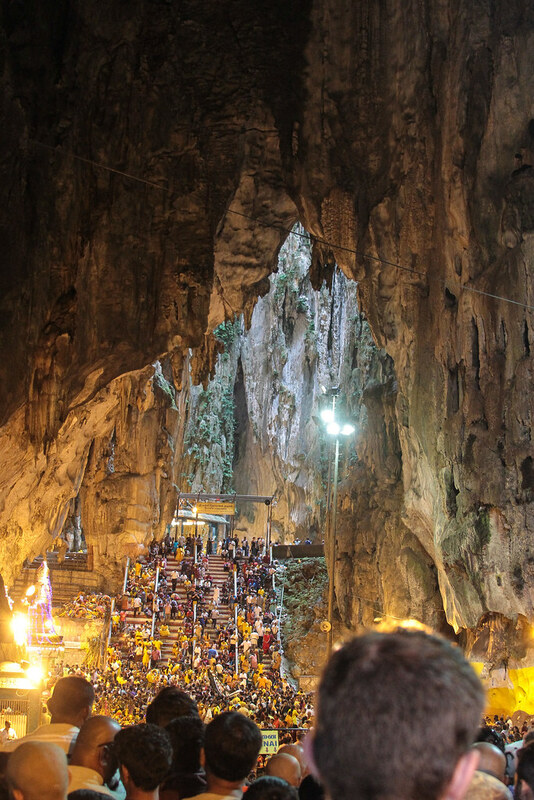 It also seemed we were not to take the place of anyone climbing the stairs, and to use these sketchy rock stairs to the left of those that the devotees are using, so we did. The start of our climb; apparently where many devotees were jettisoning their shoes. I prefer a little more to hang onto when ascending this many stairs with absolutely nothing. The red lines here are for a zipline med evac, and we had to turn around after getting a third the way up as someone did need to be evacuated out. We were guessing exhaustion or dehydration.. note fasting is part of the preparation for this event too. Going down the stairs was less fun than going up. Josh on our way up. At the top there was a locked gate, as well as some other tourists wondering if they should proceed or not. We chatted a bit about figuring out our next move, which was going to eventually be hopping over to the stairs to get in, although eventually some little kids unlocked the gates for us. There were shopkeepers at the entrance there selling water who pretty quickly told everyone it needed to stay locked and the kids locked it behind us. 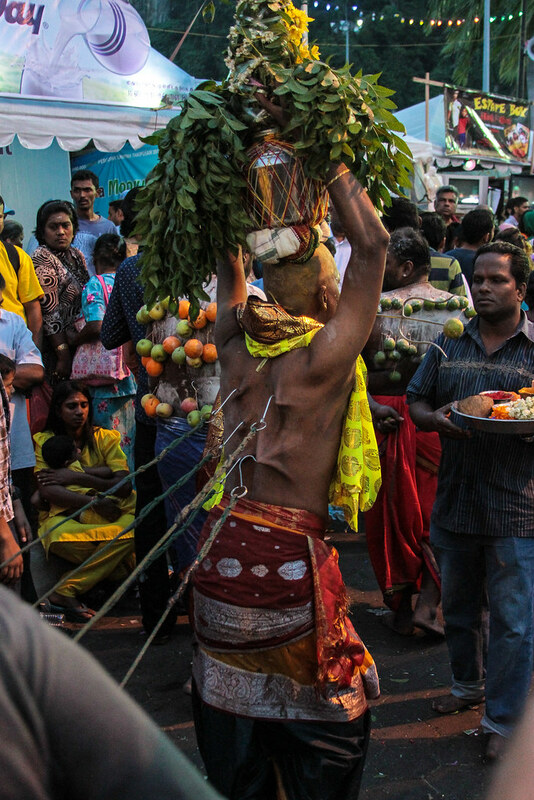 From this point on was a much slower procession to bringing the offerings to the temple, at which point hooks and skewers would be removed by priests. There was a pretty solid point of no return reached eventually. We were sandwiched in pretty well and it seems most of the crowd is likely off balance half the time just trying to descend the stairs through the cave and make it to the temple area. At one point there was a clear segmentation of people coming in, to which neither area we belonged, but we made our way out of it to the area where people were returning to the outside stairs to descend. Some more pictures from my picasa and Josh’s flickr. Josh actually wore a camera from climb to descent. Video pending.